Backpacking Background: I've been a backpacker on and off for over 25 years. I backpacked as a Boy Scout, and then again almost every month in my twenties, while packing an average weight of 50+ lbs (23+ kg). In the last several years I have become a hammock camping enthusiast. I generally go on one or two night outings that cover between 5 to 20 mi (8 - 32 km) distances. I try to keep the all-inclusive weight of my pack under 20 lb (9 kg) even in the winter. 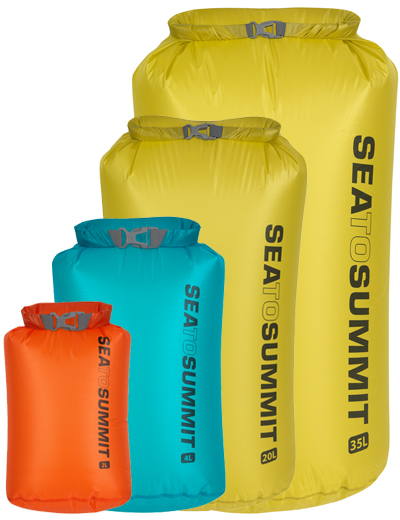 The Sea to Summit Ultra-Sil Nano Dry Sack is available in seven individual sizes ranging from 1 L (61 cu in) to 35 L (2136 cu in). It is available in Blue, Orange and Green. The Nano's are a new addition to the lightweight dry sack series Sea to Summit offers. These bags use a 15 denier siliconized polyurethane nylon fabric and have added both a lighter side release buckle and a thinner roll top closure in comparison to their standard 30 denier Ultra-Sil Dry Sacks. The manufacturer states this creates a product that is 30% lighter than the earlier version. I will mention a few other specifics noted by Sea to Summit. The sacks are fully seam-sealed with reinforced stitching and include a Hypalon (a trademarked polyethylene synthetic rubber) roll top closure. The base of the Nano is designed in an oval shape. They state the Nano has a 1,200 mm waterhead and that it is "suitable to keep contents dry in any wet situation where the bag is not submerged". Prior to testing this product I had already been using a 30 denier Sea to Summit Ultra-Sil Dry Sack for nearly a year. I typically store my down sleeping gear in a 13 L (793 cu in) sack. The first thing I noticed about the Nano was how super thin the material felt in my hand. It is not quite onion layer thin, but it is pretty close. The texture is smooth and slick to the touch. Some siliconized nylon products I've used in the past have a tacky (almost sticky) feel to them. This was not the case with the Nano. Both bags are ample in size for the things I plan on stuffing them with. In fact, I don't feel as if I'm sacrificing too much weight for the amount of storage space I am receiving. However, both bags are fractionally heavier than their list weight. The manufacturer states that the bag needs to be rolled a minimum of three times to ensure water doesn't enter. I also learned if there is leakage into the bags it typically occurs at the rolled entry point. I learned this when I called the customer service line to inquire about the waterhead rating on the bag. I called customer service, not sharing that I was testing the product, and asked them to explain this measurement. The representative was quite helpful and said he was just reviewing waterhead measurements just moments before for tenting capabilities. He told me to be prepared to 'be tech-geeked out' and stated this; "Imagine the fabric being placed tautly against a tube, and then filling that tube with water. The height in millimeters, 1200 in this case, of direct water pressure is what it would take to penetrate the fabric. This is a laymen description of the waterhead". He admitted there is no one single standard on waterproofing in the industry, and I've seen varying answers on the internet in relating to the topic, but the representative also stated a hard wind driven rain averaged 2100 mm waterhead. The sacks are designed as a niche to go into a pack for waterproofing organization in lieu of a large waterproof liner. He suggested if I wanted to do creek fording or severe damp weather camping I may want to step up to the 30 D Ultra-Sil. It was on the phone conversation I also learned that leaks generally occur at the roll point. This is because there is no way to measure if a person is rolling it properly. Proper techniques are printed on a removable tag in the bag. In most situations I've always rolled my previous bag in excess of three rotations, and I certainly plan to do so with these two as well. I received the Nano Dry Sacks the afternoon before I was heading on a trip to the Virgin Islands, and decided to toss them in my luggage to become familiar with while I was gone. On my third day in the islands I was doing some diving and decided they would be perfect for keeping some of my gear dry. 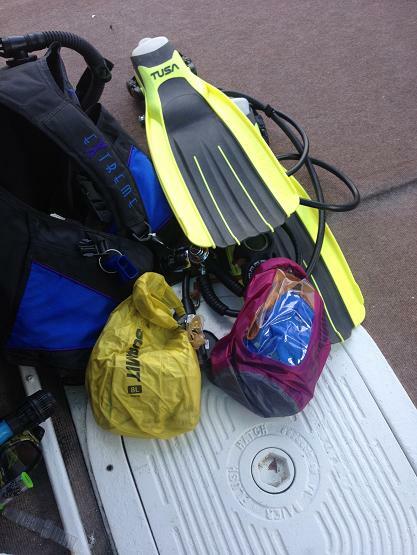 I placed a pair of shorts and a t-shirt in the 8 L (488 cu in) Nano and tossed it in with my dive gear. 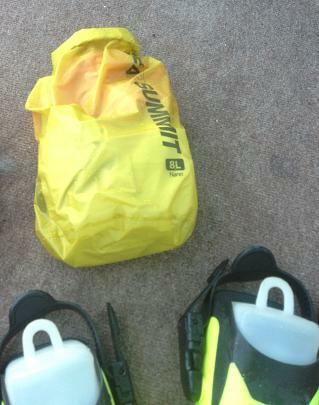 The six seat dive boat had plenty of sea spray in transit, and I put my dive buddy's cover up dress in the sack as well. By the time we were finished with two dives the outside of the bag was damp and I decided, what the heck, I was going to submerge it! I reached off the back of the boat and stuck my hand and the bag under water for about 15 seconds. My buddy was concerned for her dress, but I opened the bag and the contents were completely dry. This was obviously an un-recommended use, but it makes me quite comfortable for using the sacks within the confines of my pack. The material is lightweight and not suggested for use outside a pack where there may be a chance for abrasion, but I feel quite comfortable it will keep my gear safe and compartmented. The thin nature of the material also makes them somewhat translucent. I can visually make out the colors of some of the contents within the Nano. I can also make out items more easily in the green bag versus the larger orange one. 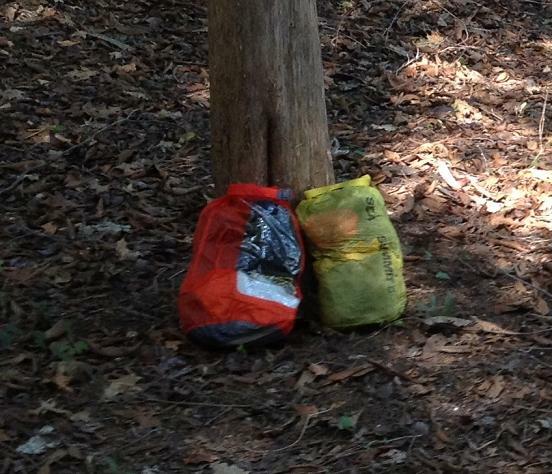 In the image with the bags next to the dive gear there is also a Sea to Summit Ultra-Sil View Dry Sack that I will be reporting on simultaneously in another report. I foresee myself storing items that I want a quick view of in the View bags for that report, and clothing, bedding or other like items in the Nano sacks. I requested and received varying colors that will also aid in quick retrieval from the depths of my pack. I can store clothing in one color, bedding in another and so forth. I will also make note the tag I removed suggested cleaning the bags by hand washing in cool water and air drying them. There is no venting system with the Nano, so if I don't push all the air out of the bag before I begin the roll process it will create an air gap in the bag. I overcome this by pushing as much air out as possible, starting to roll it, then opening and repeating before I re-roll the sack. This generally expels most of the air and works well for me. Upon receiving and reviewing the Nano Dry Sacks I'm quite impressed with the products so far. I haven't even begun to field test them in the backcountry and I am confident in their waterproofing capabilities. My gear stayed dry from sea spray and both bags also worked well compressing clothing for storage in my suitcase for the return trip home. In fact, the sacks weighed less than the typical one gallon (3.8 L) plastic Ziploc style storage bags I often use for travel. Going forward in the test series I am aware of the limitations of the bags. I do plan to use them only inside my pack, as the material could be damaged from abrasions. I don't plan on storing my down sleeping gear in the Nano, but I am comfortable trying it with anything else. The company does suggest double bagging electronics. There is only one thing about the Nano that is frustrating. It is the fact there is no pull tab on the bottom of the sack. When the Nano is stuffed full it can become somewhat difficult to remove the interior items. This is a minor frustration, and as this is an ultra-lightweight item I know they didn't add precious grams with such a luxury...but hey nothing is perfect! 25 - 26 May, 2012: I again camped with my children, but this was in the wooded areas of my family farm near Straightstone, Virginia. Elevations were approximately 625 ft (190 m) and temperatures ranged from 69 F (20 C) to 86 F (30 C). Conditions were dry but not humid and the ticks were out in force. 27 - 28 May, 2012: A public island on Smith Mountain Lake in southwest Virginia. Conditions continued to be dry with temperatures ranging from 70 F (21 C) to 89 F (32 C). Normal pond depth for the lake is around 794 ft (242 m). We motored to the island by pontoon and I did have the fortune of adding my wife to the crew this evening. 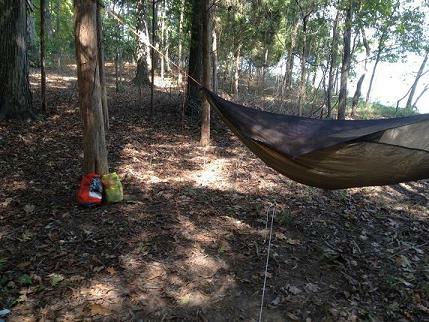 She took to the ground with the kids in our 3 - person tent and I labored above in my hammock. 14 -15 July, 2012: Long Hunter State Park, Hermitage, Tennessee. This was a two-day and one-night outing that covered 11 mi (18 km) along the 5.5 mi (9 km) Volunteer Trail that emerges on J. Percy Priest Lake. The high elevation of the park is 522 ft (159 m). Temperatures were humid and oppressing with highs around 95 F (35 C) during the day and a low around 87 F (31 C) at night. There was no moisture at all on the outing. 10 - 12 August, 2012: Bear Island on J. Percy Priest Lake. The island is a fifteen minute paddle from Anderson Boat Ramp, in Davidson, Tennessee (a part of the Metropolitan Nashville Area). Lake elevation at full summer pond is 490 ft (149 m) and I hammock camped less than twenty yards from shore on this three-day and two-night outing. Temperatures were amazing and dry; they averaged no higher than 82 F (28 C) during the day and dipped to as low as 59 F (15 C) on the second night. No true mileage was covered on this outing as it was a "Group Hang" of hammock campers from the middle Tennessee area and mostly involved water sports and fishing. 15 - 16 September, 2012: King's Chapel Pond, Arrington, Tennessee. I couldn't get the kids to the woods, so I took the woods to them. Our neighborhood has over 300 acres of untouched farm and hunting land that allowed us to take a short .75 m (1.2 km) hike to a well established irrigation pond on the farm. The elevation is 767 ft (234 m) and the temperatures were in the mid 60's F (18 C) and dipped to 48 (9 C) during the evening. There was very heavy dew when we awoke the next morning. In fact, it was wet enough to cause my 5 year old daughter to think it had rained overnight. I used the Nano Dry Sacks extensively during the testing phase and I'm thoroughly impressed with them. I used them on two dive trips, at the beach and on multiple backpacking and camping outings on or around several Virginia and Tennessee lakes. The backpacking and camping outings were rain free, but the bags were still given plenty of opportunity to experience moisture, between sea spray on the dive outing and water spray and simple dampness on bass boats and in canoes. The Nano performed as expected, superbly. I am also impressed with how well the sacks held up to environments for which they were not designed. They are meant to stow gear within the safe confines of a backpack, however, I used the bags as often outside a pack as I did inside one. They held up to damp conditions perfectly and no interior contents ever became even slightly damp, must less wet. I was impressed with the translucent nature of the sacks. When I had gear stowed within them I could often look through the bag and see what the item was. The sacks are so thin and lightweight I will probably no longer continue to use them outside the protection of a backpack, but I was interested in their integrity during the test series. At roughly an ounce, I'm quite impressed with the minimal weight the sacks give me for water protective organization. I dunked them a few times under water, for up to 30 seconds and never had a bag compromised. The Nano sacks are lightweight enough for me to replace some basic nylon stuff sacks that I use in my pack. Doing so is typically weight neutral for me, but affords me the waterproofing security. After having used them on five outings, at the beach and on two dive trips I'm happy to suggest them to any weight conscious outdoorsman. 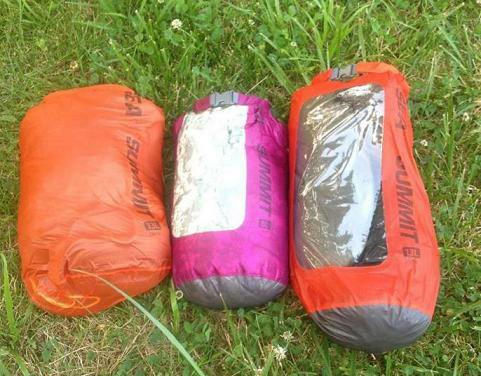 As my images show, I tested these sacks simultaneously with the Ultra-Sil View Dry Sacks. Both are very impressive products with excellent but differing features. In my opinion, this is the ideal product for the ultra weight conscious mainstream backpacker. In fact these sacks weigh mere grams more than roll top cuben fiber storage sacks I've seen offered by cottage vendors. I am completely impressed with the Nano Dry Sack, like nearly every product I've used from Sea to Summit. The company is ever evolving in their research and development, and I continue to be impressed with the items they bring to market. I own seven dry sacks from this manufacturer at this point, and at one point I was considering acquiring an Ultra-Sil pack liner. I'm so impressed with the organization these current sacks afford me at a minimal weight penalty that I don't see myself doing so at this point. I love the lightweight, waterproof and nearly translucent nature of the product. Just as in my initial report, I do suggest adding a small pull tab to the bottom of the sack. A half inch tab of grosgrain sewn into the bottom hem would even suffice. I'd like to thank Sea to Summit and BackpackGearTest for the opportunity to test the quality Nano Dry Sacks.